Computer chipmaker Qualcomm has rejected a $103bn (£79bn) takeover bid from rival Broadcom. Qualcomm said the offer, which is potentially the largest tech sector takeover to date, “dramatically undervalued” the company. It added that the proposal also came with “significant regulatory uncertainty”. Broadcom, which makes chips for products such as smartphones, was offering $70 per share for Qualcomm. The bid comes at a time of consolidation sweeping the industry. Broadcom is waiting for regulatory approval to buy Brocade, while Qualcomm is in talks to buy NXP Semiconductors. Meanwhile, Qualcomm is currently engaged in a legal battle over royalty payments with its biggest customer, Apple. A tie-up between Broadcom and Qualcomm would create the world’s third largest chipmaker behind Intel and Samsung. 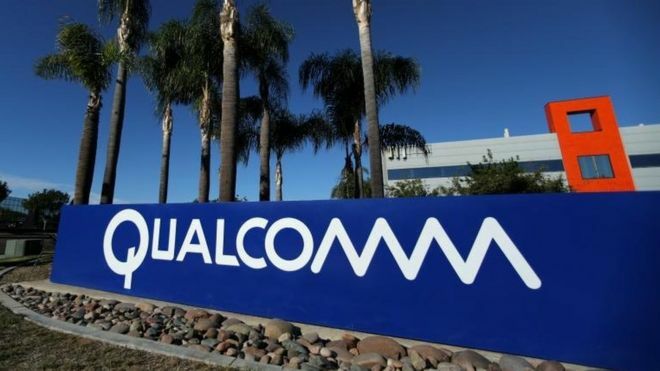 Reacting to the news, Hock Tan, president and chief executive of Broadcom, said: “We continue to believe our proposal represents the most attractive, value-enhancing alternative available to Qualcomm stockholders and we are encouraged by their reaction. The Bank of England believes that up to 75,000 jobs could be lost in financial services following Britain’s departure from the European Union. I understand senior figures at the Bank are using the number as a “reasonable scenario”, particularly if there is no specific UK-EU financial services deal. The number could change depending on the UK’s post-Brexit trading relationship with the EU. But the bank still expects substantial job losses. Many jobs will move to the continent. 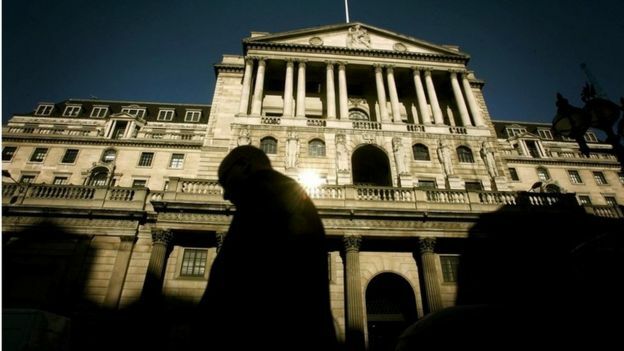 The Bank of England has asked banks and other financial institutions, such as hedge funds, to provide it with contingency plans in the event of Britain trading with the EU under World Trade Organisation rules – what some have described as a “hard Brexit”. That would mean banks based in the UK losing special passporting rights to operate across the EU. 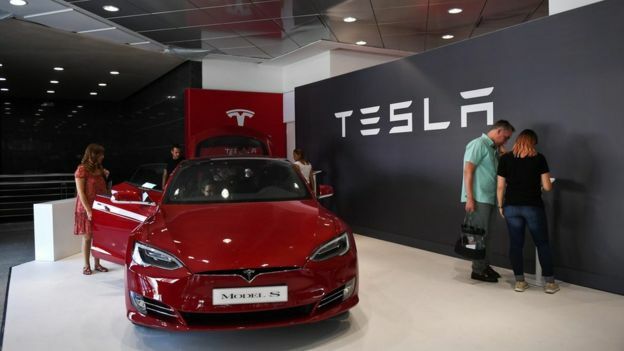 The EU could also impose other “locations specific” regulations such as where trading in trillions of pounds worth of euro-denominated financial insurance products has to be based. That could mean trading jobs moving to Paris or Frankfurt. There have been a number of studies on the potential employment impact of Brexit. A poll of more than 100 finance firms by Reuters suggested the number of job losses would be just below 10,000 in the “few years” following Brexit. I understand the bank believes the 10,000 jobs figure is likely on “day one” of Brexit if there is no deal. The Brussels-based think tank, Bruegel, said that over time 30,000 jobs could move to the continent or be lost as London’s financial sector shrinks. And Xavier Rolet, the chief executive of the London Stock Exchange, has suggested that over 200,000 jobs could go. The bank believes that is too high, and its scenario over the next three-to-five years is much closer to the 2016 study by Oliver Wyman, a management consultancy which has often been quoted by banking lobby groups assessing the impact of Brexit. Their report suggested between 65,000 and 75,000 job losses. The study said that up to 40,000 jobs could be lost directly from financial services, with a further 30-40,000 going in associated activities such as legal work and professional services. The report also argued that there could be opportunities from Brexit, such as developing bespoke financial services for emerging market economies across the Middle East and Asia including China and India. Even if 75,000 jobs do go, London would still be by far the largest financial centre in Europe with over one million people employed in financial services in the capital and across the rest of Britain. And the UK would still enjoy a healthy trade surplus in financial services with the rest of the EU worth many tens of billions of pounds. Many also believe there will be a positive outcome to the EU negotiations as the City supports many governments and businesses on the continent in raising funds and executing global deals. Those companies and firms would want to keep a close relationship with the UK and its well-developed global markets capacity. Before the referendum, many banks suggested that they may move thousands of jobs. But since then announcements have been more modest. JP Morgan said it might have to move 4,000 jobs, but since the referendum has cut that number to around 1,000. The Swiss bank, UBS, said it may move as few as 250 jobs after initially planning to relocate as many as 1,000. 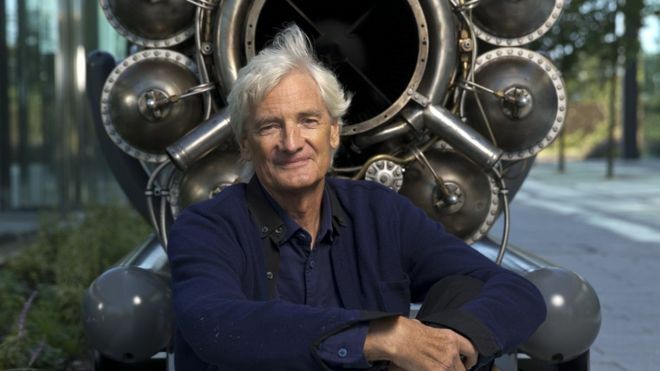 And the chief executive of Barclays, Jess Staley, said that Brexit was no more complicated than setting up a holding company in America, which the bank was obliged to do in 2016. More recently Lloyd Blankfein, the chief executive of Goldman Sachs, has tweeted that he will be spending “a lot more time” in Frankfurt despite the American bank building a large new HQ in London. German airline Lufthansa and the UK’s EasyJet have both submitted offers to buy parts of Italy’s Alitalia airline. Lufthansa said it hoped to establish a “new Alitalia”, but was only interested in parts of the existing business. EasyJet said it had submitted an expression of interest but also only wanted “certain assets of a restructured Alitalia”. Europe’s airline industry is fiercely competitive, with Monarch and Air Berlin failing in recent weeks. On Monday, the last of 110,000 Monarch customers who were abroad when the airline collapsed were flown home, according to the UK aviation regulator. Ongoing competition from budget airlines, terror attacks in popular holiday destinations, and rising fuel prices have made it difficult for some airlines to keep going. Lufthansa agreed a €210m (£190m) deal for parts of Air Berlin last week, with EasyJet also in talks to buy parts of the failed carrier. 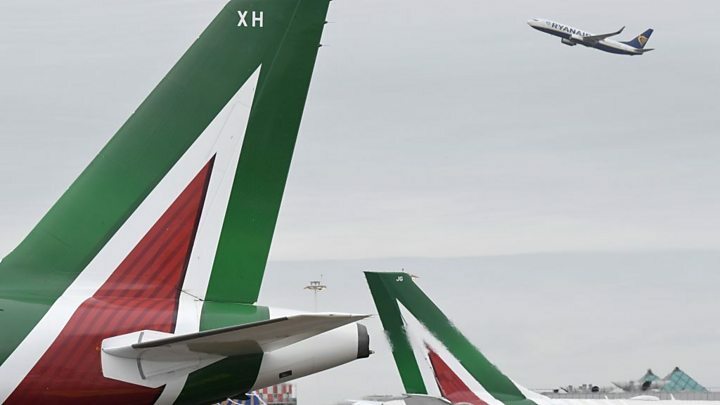 Alitalia said it had received seven offers by the 17:00 GMT deadline on Monday and would now assess them. The Italian government has postponed the deadline for making a final decision over the Alitalia sale from 4 November to April 2018. The government also announced a further €300m (£267m) in loans on Friday to keep the carrier flying. Rome has already provided €600m in funds since May, but has now extended the repayment deadline to 30 September 2018, following the decision to delay completion of the sale. 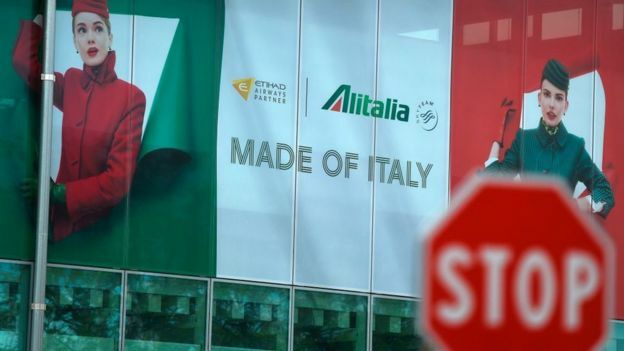 Alitalia went into administration at the start of May after staff rejected job and salary cuts as part of a €2bn rescue plan. Lufthansa said in a statement it was interested in “parts of the global network traffic and European and domestic point-to-point business”. Italian newspaper Corriere della Sera, referring to anonymous sources, said on Monday that the Lufthansa bid was worth €500m, but was likely to be rejected as the authorities in Rome wished to sell the airline’s assets as a complete package. The newspaper reported Lufthansa was bidding for the planes, airport runway slots and air crew and was proposing to halve Alitalia’s workforce of 12,000 employees as well as reducing its short- and medium-range flights. Irish budget airline Ryanair expressed early interest in Alitalia, but two weeks ago said it was dropping the idea. At the time it was struggling to contain the fallout from a pilot shortage, which led to the cancellation of flights for about 700,000 passengers. Ryanair is set to challenge a Lufthansa deal to to buy parts of failed German carrier Air Berlin. The budget Irish airline said it would take the €210m deal to European competition authorities. Lufthansa plans to use Air Berlin planes to expand its Eurowings budget airline business. Air Berlin filed for bankruptcy in August after its main shareholder, Etihad, said it would not give further financial support. Germany’s second-largest carrier has since been negotiating with potential buyers for parts of its business. Lufthansa has agreed to buy Air Berlin’s Austrian leisure travel airline Niki, its LG Walter regional airline and 20 additional aircraft. Ryanair previously described the negotiations as a “stitch-up” intended to strengthen Lufthansa. “We will be referring the matter to the EU competition authority in due course,” a Ryanair spokesman. Andreas Mundt, head of Germany’s cartel office, said the European Commission would take a close look at the deal and that German authorities would follow the process closely. Lufthansa chief executive Carsten Spohr said earlier he expected the Air Berlin deal to receive European Union approval by the end of the year. Shares in Lufthansa rose 2.8% in Frankfurt. Air Berlin, which accumulated debt for almost a decade, reported a record loss of €782m (£713m) for last year. 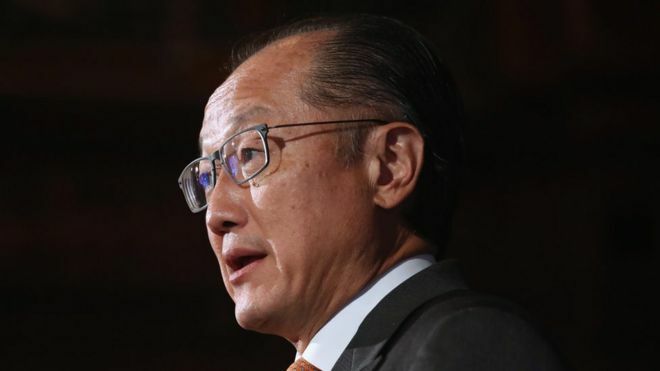 The world is on a “crash course” as people’s hopes collide with a future in which millions of jobs are automated, the World Bank chief has said. The World Bank president was speaking in New York ahead of the group’s annual meeting in Washington DC this week. The World Bank plans to publish a ranking of countries that measures investments in “human capital”, such as education. “The one thing you know for sure that you’ll need in whatever the economy looks like in the future is people who can learn,” he told the BBC. The push for education and health investments comes as outlooks for economic growth improve. In July the IMF said it expected the global economy to expand by 3.5% this year and by 3.6% in 2018. IMF managing director Christine Lagarde said updated forecasts, to be released this week, were likely to be even more optimistic. 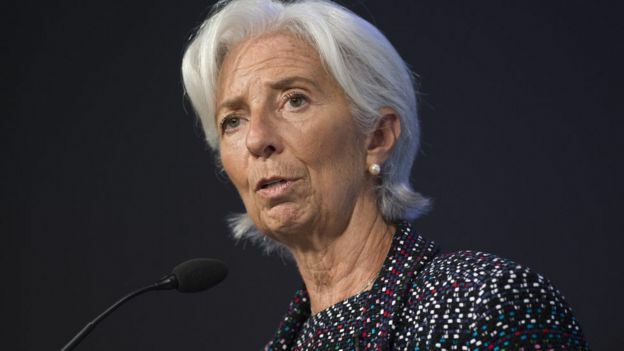 However, bankers from the IMF, World Bank and other organisations have warned that the progress is threatened by political movements that favour trade barriers, isolation, military aggression and other measures. Political uncertainties are increasingly behind many of the risks identified by sovereign debt analysts, said Moritz Kraemer, managing director of S&P Global Ratings, which tracks economic and political movements in dozens of countries to devise credit ratings. The subject was also the topic of a speech by European Central Bank president Mario Draghi earlier this year. Ms Lagarde said this month that policymakers “should not let a good recovery go to waste”. Insolvent airline Air Berlin, Germany’s second-largest carrier, is pushing ahead with talks with EasyJet and Lufthansa about a possible sale. Air Berlin, which is still flying after a 150m euro (£130m) rescue loan from Germany’s government, said a deal could help 80% of its staff. 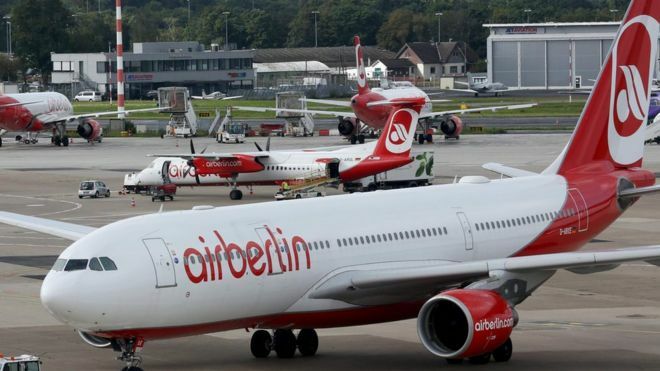 Talks will continue with the two airlines until 12 October to sell parts of the business, Air Berlin said. The final deal would need to be approved by European Union regulators. Earlier, British Airways’ parent company IAG confirmed it was putting in a bid for part of Air Berlin, but said it expected the airline would go mainly to Lufthansa. IAG chief executive Willie Walsh said at an industry conference that it would not “come as any surprise” if Lufthansa was the main winner. 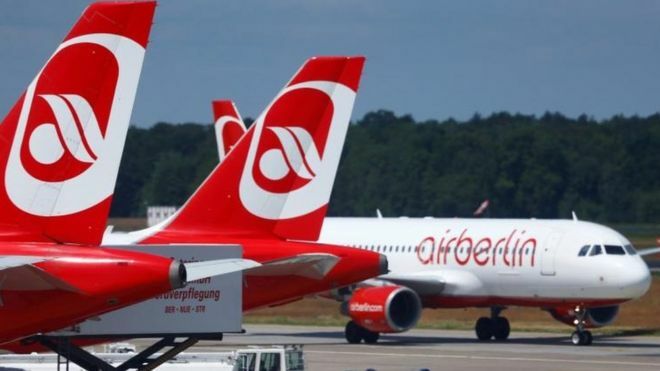 Air Berlin, which has about 140 aircraft, filed for insolvency in August after its main shareholder, Gulf carrier Etihad, withdrew financial support. Earlier this month, the European Commission approved the 150m euro loan from the German government, saying it would help to protect the interests of air passengers. Air Berlin was recently forced to cancel about 100 flights after a large number of its pilots called in sick. It prompted the airline to accuse them of sabotaging rescue talks with potential investors.